It has no relation to crocus, in the iris family. 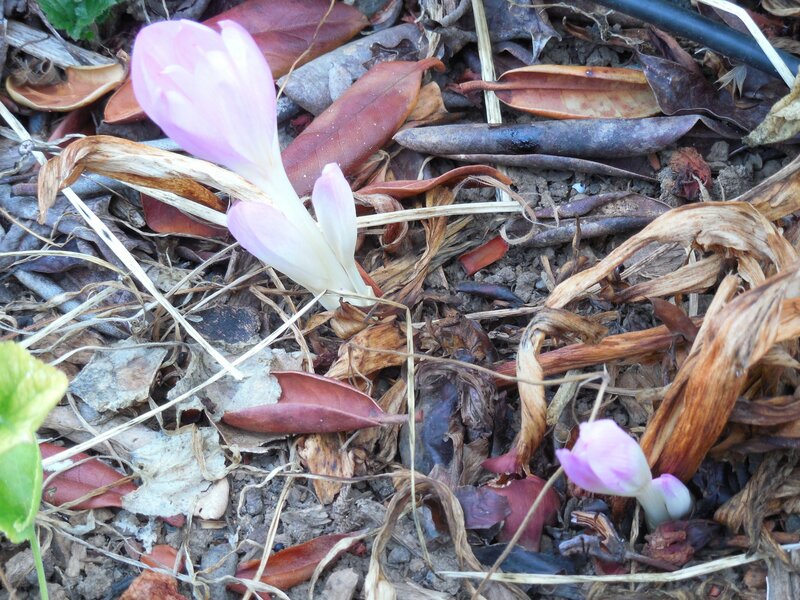 Above, the buds are emerging from the ground in the same hole as their dead leaves did last spring. There should be 3 to 4 times as many flowers as I see this year, because there were that many leaves a few months ago. Perhaps this summer was too hot for the bulbs. I understood these bulbs can take full sun, but apparently, I was mistaken. 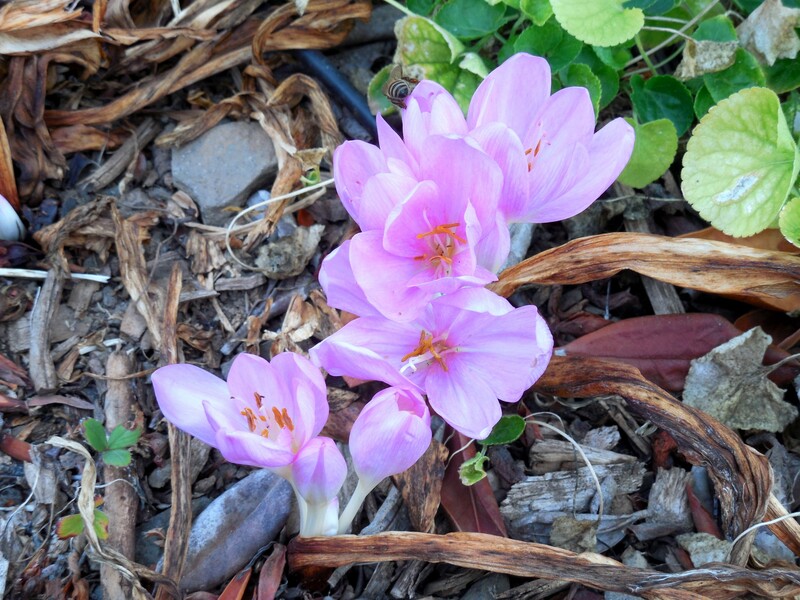 Categories: Uncategorized | Tags: autumn, bulb, colchicum, crocus, family, iris, leaves, lily, spring | Permalink. This shrub produces more flowers every year! How is that not to love about a plant? There are many types of hydrangea, some are smaller, some larger. Some get pruned to the base every year, others merely get dead-headed (dead flowers are cut off), to encourage flowering the next year. 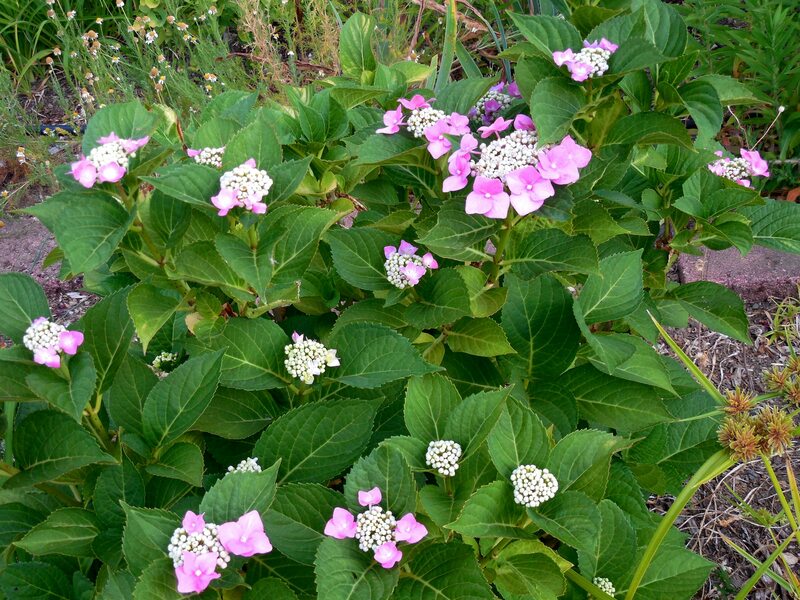 As far as flower color, pink or blue, that depends on the ph environment of the soil in which the bush grows. I wish I could figure out which type of hydrangea I have. One of the two in my garden is pictured above. The other has never bloomed. I am reluctant to cut all the branches to the base, for fear none of the branches would return the next spring. The two specimen that I have were acquired at different times from very different places, they both get a lot of sun exposure and their local ground has been enriched. Various hydrangea could be like relatives, they are in the same family, but even siblings are different from each other. Categories: Uncategorized | Tags: bush, dead-head, environment, family, heredity, hydrangea, ph, relatives, shrub, soil | Permalink. These flowers are growing from a crop of winter broccoli. Perhaps it was the fickle spring weather this year that contributed to the short window of time edible broccoli buds were available and the proliferation of weeds in the gardens. This year, I observed the strong resemblance among the flowers of broccoli, kale, brussels sprouts and probably all other cruciferous plant flowers. When I checked my dictionary for the spelling of cruciferous, I learned these plants are all in the mustard family. The last few years, I’ve been trying to purchase organic, non-hybrid broccoli plants, that might come true to seed. Time will tell if the seed will produce plants that will grow over the winter and produce broccoli florets next spring. Categories: Uncategorized | Tags: broccoli, brussels sprouts, buds, cauliflower, edible, family, florets, flowers, kale, mustard, non-hybrid, organic, seedling, seedlings, weeds, winter | Permalink. I love the smell and look of chive flowers. I love all the members of the allium family. I love the smell and taste of onions. This plant is right outside my front door, in view of my kitchen window. When people who are not gardeners (think city-folk) come to visit, I love to lead them though my herb garden and invite them to taste particular plants. When my then-two-year-old grandson visited, I did the same with him, but quickly learned my mistake. He naturally thought he could take any leaf and taste it. Of course, he headed right toward a large (to him) rhododendron bush – which is poisonous. I noticed in this photo that you can see some of the different stages of chive flowers opening. Just got lucky, this time! I am heading toward an art show where I will display my pottery and ceramics. The chive and armeria flowers will grace some of my vases. I saw the last tulips starting to open, and I cut some peony buds, just because they are pretty that way. The lilacs are on the down side of their blooms. Day lilies and foxglove are about to open. Stock and Jacob’s ladder have so few flowers this year. Categories: Uncategorized | Tags: allium, armeria, bulb, chives, day lilies, day lily, edible, family, flower, foxglove, herb, Jacob's ladder, lilac, onion, peony, spring, stock, tulip | Permalink.